Snow cones are a summertime tradition. When you�re at the pool, on the beach, strolling on the boardwalk or playing in the park, snow cones are always a staple to having a good time and cooling off. 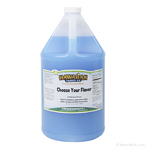 Our snow cone syrup for sale online brings the snow cone cart to your house. 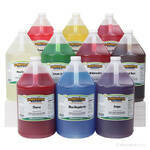 There�s no need to spend money at overpriced concession stands when you choose your own flavor bulk shaved ice syrup. 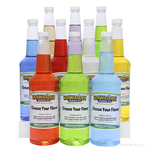 You�ll always have your favorite flavors and spend a fraction of the cost. Are you planning a big summertime party or do you have barbecues at your house regularly? Maybe all the neighborhood kids enjoy playing at your house�s pool. 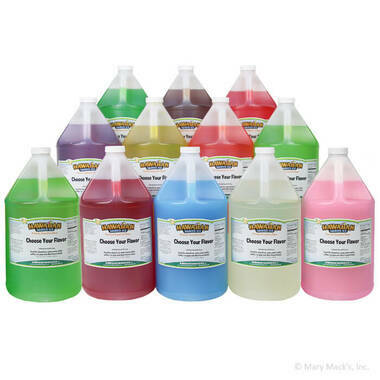 Our 12 gallons of shaved ice syrup is an inexpensive and delicious way to make sure everyone stays cool at your house and at your events. 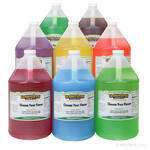 When you buy a bulk gallon shaved ice syrup package, you save time and money. Our 12 gallons of shaved ice syrup is the equivalent of 40 quarts of individual bottles. This bulk gallon shaved ice syrup package will save you more than half off the price of individual quarts. That�s refreshing savings.